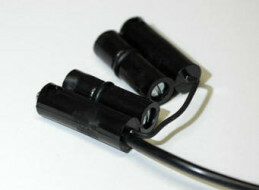 Replace your AA batteries or Turbo battery with Paramount’s new “Saver” Battery cable. Insert battery module into strobe until you feel the spring contact. Tighten the two screws which makes the rubber ring expand thereby holding the module in place. battery cables have metal pins that scratch the inside of the flash; this could be a problem when dealing with OEM warrantees. Faster recycle times than AA batteries. Safes strobe life. Will not overheat your strobes like the High Voltage batteries do. eg. Quantum Turbo, Lumedyne Cyclers, Dynalite Jackrabbit. Since batteries are only about $ 10.00 each you can keep 3 or 4 batteries in your bag for fast change. Heavy duty design. Engineered not to make any marks on your strobe which voids warrantee. Although recycle time is faster (3-4 seconds) compared to AA batteries (4-5 seconds) and High Voltage Turbo batteries (1.2 seconds). Lead-acid gel cell batteries must be recharged immediately after use, if not this type of battery will degrade. There is nothing to come apart or come loose assuring years of reliable use. We mold the module on a Heavy-Duty 18 AWG polyurethane cable. Buy the Gel Cell Battery and the charger from sources on the internet. We can provide the links. The batteries can also be purchased from your local Home Depot or Security alarm store. Buy an attractive camera bag to hold the battery and your system is complete.